After weeks of speculation, Charles Green quit as Rangers CEO last Friday following a series of damaging revelations about the deal that brought him to Ibrox last year. Just 24 hours later, Rangers were beaten 2-1 at home by Peterhead as they suffered their third defeat of the campaign. 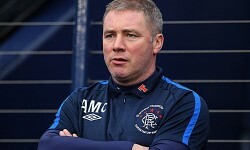 It was a result which means that Ally McCoist’s men have now failed to win one third of their matches in Division Three this season, despite many people predicting at the start of the campaign that they would go the entire year unbeaten. It seems that Rangers just can’t seem to get it right on or off the pitch. Every time you think they have turned the corner, something else crops up that brings yet more ignominy on the ailing fallen giant. Gaining promotion to Division Two and being crowned league champions is, of course, small comfort to a fanbase who expected nothing less, and you get the feeling that many of them would actually trade everything just to have the club back on the right footing again, both financially and in terms of its once-proud reputation. Losing to East Stirling on Saturday would, however, probably top the lot in terms of embarrassment this season. The Ochilview club have finished bottom of the Third Division six times in the last ten years and are currently heading for number seven, marooned as they are at the bottom of the pile again. They are ten points behind their nearest rivals and have lost their last eight consecutive games, including a humiliating 9-1 defeat at Stirling Albion, a 6-0 drubbing at Peterhead and a 5-1 reverse at Queen’s Park, leaving them nursing a painful goal difference of -45. In the three previous meetings between the sides this season, Rangers have won all three, scoring 14 goals – that’s an average of nearly five per game. It would be the ultimate rotten cherry on top of their burnt and stale cake, therefore, if the Gers were to take anything other than three points on Saturday. The visitors are overwhelming favourites to avoid such a humiliation, priced at 4/25 to win the game. The draw, on the other hand, is available at 21/4 and a home win is out at a staggering 21/2. That said, East Stirling have scored in all three games against Rangers so far and so odds of 3/4 on both teams finding the net again in this one could do decent business. Odds of 19/20 on more than 3.5 goals in the game could also prove popular, and new customers who sign up to bwin online and use their free £20 bet to back this outcome stand to win £39 if successful. Avoiding more embarrassment is the Light Blues’ main priority in this one, though. With just one more game remaining after this one, most Rangers fans will probably be thinking that the end of the season can’t come quickly enough.